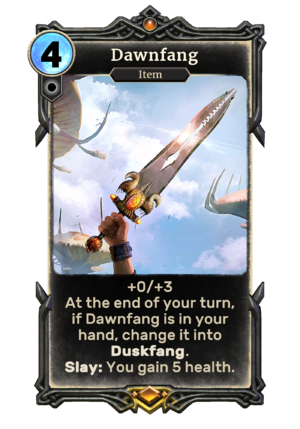 At the end of your turn, if Dawnfang is in your hand, change it into Duskfang. Slay: You gain 5 health. Dawnfang is a unique legendary Neutral item card. It is part of the Isle of Madness story set. Dawnfang previously appeared in the Shivering Isles expansion for Oblivion.